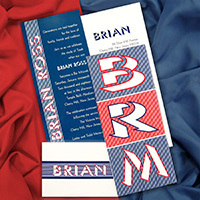 This incredible catalog adds an entirely new, unique and different look to our already diverse collection. 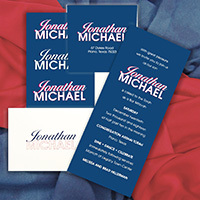 We took our widely popular "under glass" concept to a whole new level of ingenuity and affordability which will stand alone in the market place as a one-of-a-kind Bar/Bat Mitzvah catalog. 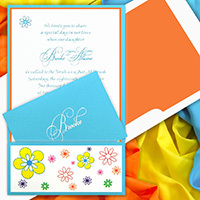 The features of this collection are abundant with the use of multiple colors throughout the invitation ensembles, a huge assortment of original and colorful patterns, great new layers, borders and surprise reverse sides to the invitations. 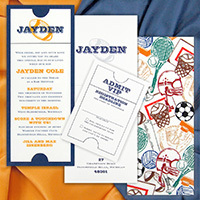 The complete flexibility of this collection allows you to mix virtually all the patterns and papers. 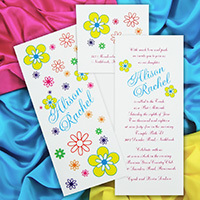 This catalog is dynamite in every way and is especially suited to those that like to create and customize their invitations. Most retail prices are at $589 per hundred.